Chesterbrook Woods consistently enjoys an active and vibrant real estate market. The 1-light from DC location, enviable tree-scape and top rated public schools make for desirable attributes impacting property values and contribute to long term demand for the neighborhood. The Chesterbrook Woods real estate market in 2017 performed better in most categories than 2016. The number of properties sold remained unchanged at 26, however both average and median home sales price were up year-over-year. Average sales price climbed 6.9% while median was up 9.8%. The Average Resale price increased 8.7% while the Average Price for New Builds rose a respectable 4%. Resale Median price jumped 13%, and New Build Median price edge up 5.2%. The increase in Resale Prices outpaced those for New Builds which is to be expected as there is typically more room for price appreciation in the lower brackets where more buyers exist than in the upper brackets. Comparing the market to 2007 which was still the height of the last real estate cycle in our area, New Build activity has doubled (from 3 to 6) which translates into a substantial jump in average sales price in the last 10 years. Land in McLean is in limited supply and the best lots in the best locations such as Chesterbrook Woods command the highest prices. Chesterbrook Woods provides a stable stream of tear down lots for builders and individuals looking to erect new homes. Our lots are on average at least a third acre, and a few lots are as large as .6 - 1 acre. Two of the 26 sales as published in MRIS in 2017 were lot sales upon which new houses are to be built. Off market, there were an additional 2 lot sales in the neighborhood, to my knowledge. Days on Market for an active listing shortened from 56 to 47. Excluding new builds, the number of days on market for an active listing shrank by 60% for the listing. When accounting for total days on market for a property (when a property is listed more than 1 time without having been off market for 90 days), days on market increased from 108 to 115 and, excluding new builds, from 65 to 94 year-over-year. This stat indicates that last year some sellers had to make 1 or more price adjustments to get a contract. Resale houses priced correctly when first introduced to the market sold on average within 18 days down from 45 in 2016. Days on Market for a new build doesn’t tell the full picture as some builders list their properties for sale prior to completion and buyers in general are more likely to move forward with a contract once the house is completed. People ask me what to expect for the Chesterbrook Woods Real Estate market in 2018. I expect fewer new builds to sell as asking prices have increased substantially above the high sale of 2017 which was $2,650,000, and there were fewer lot sales last year. All the better should the market prove otherwise as new records would be set. For example, 2 of the three current new build listings as of Feb. 1, 2018 are asking just under $3.0 million, about 13% more than the high sale for 2017 which is 3X the increase in the average new build sales price from 2016 to 2017. I expect the resale market to track 2017 units sold, +/- 10%, although the rate at which prices have appreciated will likely slow. It is unknown at this point how higher interest rates and the new tax laws will directly affect homes sales, although I believe the impact to be manageable. The good news is that our fundamentals remain strong – proximity to DC, highly rated schools and desirable neighborhood qualities such as hiking trail access, an active citizens association, and a balanced mix of home styles and sizes. If you are curious about the potential value of your home or plan to move this year, I urge you to contact a trusted source of local real estate knowledge and experience to review your specific situation. Lizzy Conroy is a resident of Chesterbrook Woods and an active and experienced Realtor® with HBC Group of Keller Williams McLean/Great Falls. She co-leads the team with Karen Briscoe. Their team of agents serve communities throughout the DC Metro Area including Northern Virginia, suburban Maryland and Washington, DC, and consider it an honor to improve and impact lives through real estate. 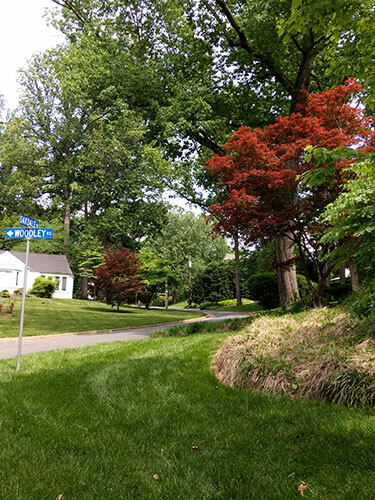 If you have questions about Chesterbrook Woods, or you need advice on the area of McLean, contact Lizzy today to discuss how she can assist with your real estate needs: www.ChesterbrookWoodsNeighborhood, 202.441.3630, Lizzy@HBCGroupKW.COM.